The global legal industry is valued at £379 billion. This is bigger than the economies of Ukraine, Greece and Qatar combined. On 11 February the industry’s future was the subject of debate. 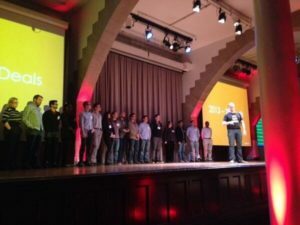 Around 150 academics, entrepreneurs, GCs and other lawyers gathered at Cooper Hall for ReinventLawNYC. The conference is part of the ReinventLaw series, which is the brainchild of Michigan State professors Daniel Martin Katz and Renee Newman Knake – the trailblazers of legal tech education. David Perla, the founder of Pangea3 turned VC, gave a concise overview of the legal tech landscape. The slides of his 10 min speech easily referenced over 100 startups across 10 areas: referral networks, virtual staffing, legal research (e.g. through crowdsourcing), litigation (e.g. eDiscovery), case management, online dispute resolution, document automation, subject matter solutions (e.g. for immigration, which Chase Hertel elaborated on in a separate presentation), billing and e-signatures. A couple of speakers later, as if to put theory into practice, Joshua Kubicki asked the entrepreneurs in the audience to come up to the stage so as to receive a well-deserved round of applause. Susan Hackett identified something many have come to accept: “most in-house lawyers are lawyers first, then clients / business people – this needs to be switched around”. While, especially prior to the 2008 crisis, it may have been enough to choose two out of faster, better and cheaper, clients now demand all three. And the above entrepreneurs are offering only some of the many ways to achieve this. Even if better times will return, this change in expectation is permanent. As Richard Susskind put it “the toothpaste is out of the tube”. Jeff Carr, the GC of FMC Technologies, claimed that this shift towards technology is already happening: “Clients are increasingly insourcing their own functions”. His message to the lawyers in the audience could be summed as: “convince your counsel to adapt, otherwise you’ll both be out of a job”. These sentiments were also echoed by Cisco’s GC Mark Chandler: “We’re here because there’s a moment to be seized”. In discussing the possibility of computer contracts, Harry Surden gave one of the most interesting talks. He defined these a contract, the compliance of which a PC can determine. Surdent distinguished between data oriented, semantic and automated contracts. While not a pipedream, there are currently a number of barriers, crucially the difficulty of the program understanding abstract or subjective words (e.g. reasonable) and handling legal uncertainty. I found the idea that new properties can be added to the contract (e.g. using the current LIBOR rate to calculate interest) particularly interesting. The person who, in my mind, took the idea of technological disruption in law mainstream closed out the day with a 20 min presentation on artificial intelligence. Just because the technology is available does not mean that disruption will automatically occur. Susskind kicked things off with a story that exemplifies this well. In 1985 (7 years before the Internet was invented), he programed software that could answer 2,000 questions about the Latent Damages Act 1986, together with an Oxford Professor who was effectively the author of the act. The program received positive coverage from UK / international press, and the two of them expected that, in 10 years, such programs would be widely used by lawyers. Over 25 years on, such programs are only sparsely used. It’s difficult to identify the precise reasons. Lack of financial pressure from clients and their lawyers were probably the driving forces. However, this pressure is now being felt by both sides. Add to this the disruption in other services industries, and it should become clear why LegalZoom was on the verge of filing for a $120 million two years ago.